Marko Pavic was born in Belgrade but since many years he is active in Italy where he lives. Graduated at the "University of Music" of Rome, his well distinguished guitar playing, merges the 70's style without neglecting the great riffs of the early 80's and this mix of elements characterizes his first album Taste some liberty, released in 2005 by Anteo Records, a debut CD enriched by the presence of outstanding musicians such as Kee Marcello, guitar (Europe, K2), Tony Franklin, bass (Blue Murder, Whitesnake), Vitalij Kuprij, keyboard (Artension, Ring Of Fire) and Daniel Flores, drums (Mind's Eye). The album, distributed throughout Europe, is well acclaimed in Italy and other countries by the critic who exalts the artist's songwriting and Marko's skill not to lapse into a boring technicality encouraging listening to the songs. Songs such as "Summer of '98" (first single followed by the videoclip), "Desperate Cry" e "Night Life" stays in the listener's mind since the start. With the new album Unconditioned, Pavic extend their horizons towards new musical boundaries, mixing the modern sound with classic rock. 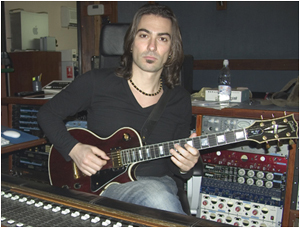 In July 2010 Marko joined the italian band Big Ones and recorded "Vertigini", the band's second album for Warner Music Italy. January 2015, Pavic are back with a renewed lineup and a new album Is War The Asnwer?. The band was invited to play the Rock In Idro festival in Bologna (Italy), sharing the stage with Iron Maiden, Alter Bridge, Black Stone Cherry, Opeth and more. In october of the same year Pavic toured Europe with Circle II Circle (Savatage).